In the previous four issues we have considered what could be termed “The Global Worship Phenomenon,” considering it as “A Work of God“ which has been enhanced by “The Effect of Globalization and Communication“ and enriched by “The Rediscovered Relationship of Worship and Missions.” We examined some of the “Consistent Issues“ which crop up in worship discussions and debates around the globe, and saw that “The Bottom Line“ in these debates (everywhere and in every age) may well be the question: How do we balance the need for biblical fidelity with the need for cultural sensitivity and relevance in our worship? 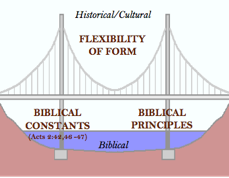 In 6.5 (May 2011) we looked at two daunting “Challenges” to answering this question: (1) the almost total silence of the New Testament as to specific matters of form in worship; and (2) the fact that people (within as well as across cultures) are so enduringly different as far as their tastes, preferences and points-of-view related to the practice of corporate worship. These facts could easily lead us to despair about ever finding our way through the maze of possible and actual applications of worship in our churches, not to mention in churches around the world. Every Christian group wants to be “biblical” in its approach to worship. But just what does that mean, and how is that to be played out in a given cultural context? One way of looking at the issue is by means of an illustration involving a single-suspension bridge. This illustration applies equally, and has been effectively used, in all sorts of different cultural contexts. A single-suspension bridge (in this layman’s understanding) is supported by two sturdy towers, which are embedded deeply and firmly in the earth so as to be immovable and to give stability to the entire structure. However, a considerable amount of the weight of the bridge is also borne by the suspension span, the cable stretched between the towers; this cable however, unlike the towers, has built flexibility so that it can adjust to winds, changes of the temperature, and the like. However, as already noted, there is a huge range of worship decisions that are not specifically addressed in Scripture (see Worship Notes 6.5); and principles by definition must be applied in specific situations. This means that, from church to church, from culture to culture, and indeed form age to age, biblical worship may well (and indeed does) look very different as it fleshed out in particular contexts. God seems to allow for, and even delight in, such diversity. I believe it is the responsibility of each local church and its leadership to study the Scriptures, their congregation, and their surrounding culture, and then prayerfully and make decisions about what worship is going to look )and sound) like in their own particular setting. hese decisions should then regularly be subjected to biblical scrutiny and evaluated; always bearing in mind that the ultimate goal is worship, not church growth or evangelism or whatever. 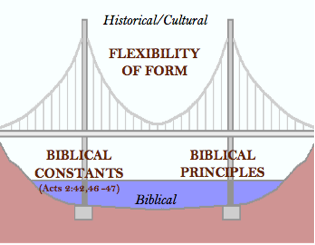 NOTE: Please see Worship Notes 2.8 [August 2007] for a much fuller treatment of the Bridge illustration, as well as a collection of historical and present-day quotes which speak to the issues of cultural diversity in worship.